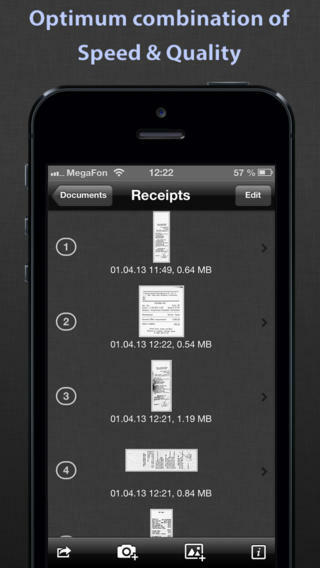 SharpScan iPhone App Review: Awesome PDF Scanner! SharpScan is an iPhone app developed by Pixelnetica. If you need a robust, polished, and effective tool for scanning PDFs, this app has definitely got you covered. There is nothing I hate more than having to scan contracts. Having to print out the contracts and sign them is a pain…but then scanning the pages and turning them into one big file is even worse! Thankfully, SharpScan is here to make my life (and yours!) way less painful! Getting started with this app is easy. There is an awesome quick start guide that really helps to get you oriented. Boasting the ability to take your image shots from photo to usable document in three seconds flat, SharpScan is a tool that really makes scanning easy. It also boasts lossless compression! SharpScan also makes sure that you don’t have document headaches by getting rid of shadows and/or distortions! How handy is that? As an added bonus, you can always undo any changes: no need to worry about over-editing an image until it is impossible to read! Be forewarned: this app does leave a watermark. If you want to remove this watermark, it will cost you $2.99, payable through in-app purchase. SharpScan is a great tool! It has a ton of automatic editing options, and it plays nice with Dropbox. For a busy professional on the go, what could be better than this helpful document manager? This app is great for managing documents, contracts, or other similar items. In addition, this app could be used to share receipts, business cards, or presentation slides with other members of your team. SharpScanis compatible with iPhone, iPod touch, and iPad. Requires iOS 6.0 or later. This app is optimized for iPhone 5.